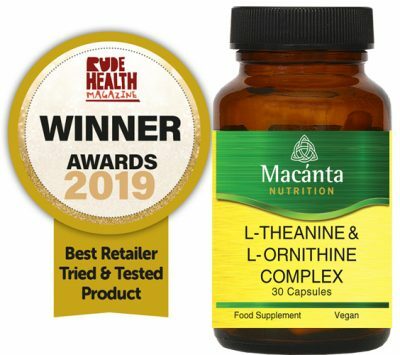 L-Theanine & L-Ornithine Complex gives you a powerful combination of L-Theanine, Lemon Balm and Chamomile, combined with B Vitamins, Hops and Ornithine. This complex has been formulated to relax, de-stress, and calm the body. L-Theanine is a natural amino acid, found mainly in green tea. Lemon balm is an herb that has been found to encourage restful sleep, and can induce a sense of calm. Chamomile is known to support relaxation and works to aid a more restful sleep, while B Vitamins are key to maintaining the functioning of the nervous system. As a food supplement for adults, take 1-2 capsules per day.